If you’ve come to this page, then it’s likely that you feel self-conscious about your missing teeth, or you’ve had to limit your food choices because of them. If so, Family Dental Practice of Newington has exactly what you need. We offer a range of effective teeth replacements that can reliably rebuild your smile to last a lifetime. From traditional bridges and dentures to state-of-the-art dental implants, we have everything you need to regain your confidence and oral function. Which one is right for you? To find out, contact us today for a consultation. 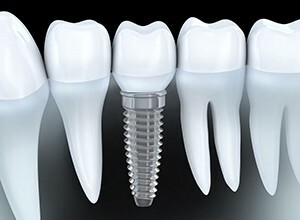 Dental implants are currently the premier tooth replacement solution available today. They are the only treatment that completely restores a tooth from the root up, and they can be used to replace any number of teeth. Thanks to their high-quality materials, they are virtually identical to real teeth, and with the proper care, they can easily be expected to last for 30 years or more. 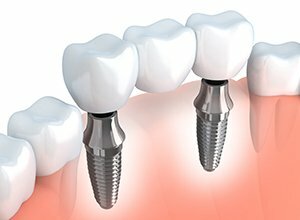 If you’re looking for the next best thing to nature, dental implants are the way to go. Do you have a single missing tooth or a few in a row? 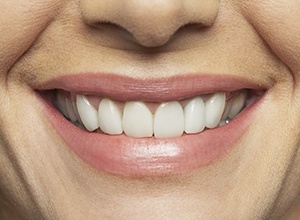 With a dental bridge, we can quickly help you say “Goodbye!” to the gap. To form a dental bridge, two dental crowns will be placed on the teeth on either side of the space, and these will be attached to prosthetic teeth to close it. This will not only restore your smile’s appearance, but it will also prevent your remaining teeth from drifting into the gap (which happens often after tooth loss). If you are missing an entire row of teeth, full dentures are one of the quickest and most affordable ways to replace them. They consist of a realistic-looking gum-colored based attached to ceramic teeth, and they simply sit on top of the gums. With them, we can drastically improve your ability to speak clearly and eat comfortably as well as restore the original shape of your face. Our team will work with you to make sure you leave our office with a set of teeth you’re proud to show off. 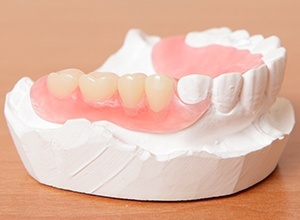 Partial dentures are used to replace multiple missing teeth for a person who still has some of their original teeth left. They are custom-made for every patient to seamlessly fit in among their natural teeth, just like the missing piece of a puzzle. They typically use small metal clasps to stay in place and can be easily removed for cleaning or when you go to bed.